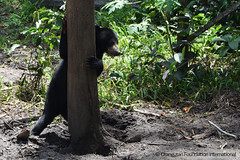 Among the young and innocent animals that arrive at Orangutan Foundation International’s (OFI) Orangutan Care Center and Quarantine (OCCQ) in Central Indonesian Borneo (Kalimantan Tengah) desperately in need of care are not only orangutans but also sun bears. 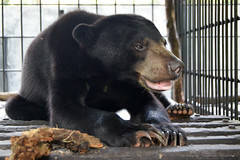 Chico the bear is a comparatively new arrival at OFI’s Care Center. This young juvenile’s distinctive sun bear chest patch is divided in two, resembling birds winging their way toward each other. 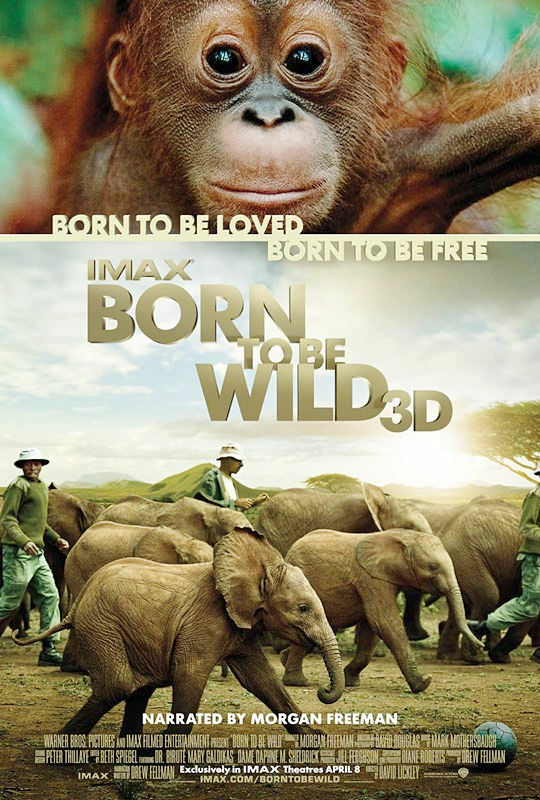 Were it not for OFI, Chico would have remained a captive removed from the wild, forced down a path not of his own choosing. 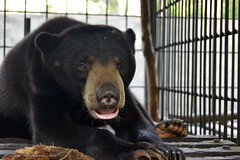 Chico was rescued from Jakarta. Ibu Ismutia spotted Chico in a tiny cage at Pantai Mutiara harbour. 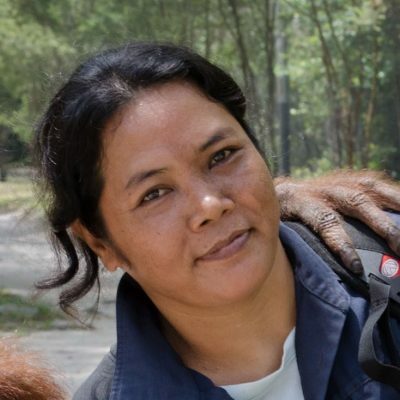 After sharing her discovery over Twitter, it wasn’t long before word reached Jakarta Animal Aid Network (JAAN) and the Jakarta Forestry Department as well as OFI’s President, Dr. Biruté Mary Galdikas. They stepped in to liberate Chico and deliver him into the care of OFI in May of 2017. Upon arrival, he was malnourished and required extra food to bring him up to a healthy weight. He exhibited the trauma of being removed from his mother too young, continuously suckling his paw as a form of self-comfort. When using this coping mechanism, Chico emitted a low soothing hum, like a small engine. Sun bear cubs typically stay with their mothers for the first 18 months of life. Young cubs depend on their mothers for everything, from milk to affection and security. This sense of security is ripped away when cubs are separated from their mothers too early. Chico spent his first few months at the Care Center in his own enclosure. But he kept himself busy, digging around and extending his paws to rake the mud outside. When his enclosure needed cleaning, he would hang back to avoid water from the hose. He would pace back and forth, another stereotypic behavior of bears under stress. In response to this behavior, OFI moved him into a bigger enclosure featuring a communal feeding area, and an open space filled with trees, platforms, mud, holes and logs to play in. 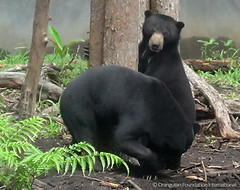 The new space would be shared with slightly older and bigger bears, Ori, Komet, and Bonnie. At first, Chico inquisitively sniffed in their general direction, nuzzled through the partition, and poked a paw through the bars, reaching out to try and stroke his new companions. He also slept with his back to them, exhibiting trust. 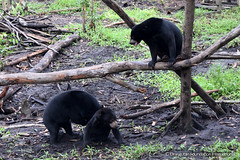 In the wild, sun bears are primarily solitary. 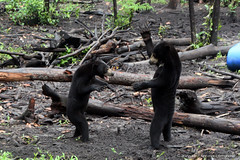 However, removed from the forest, they benefit from the presence of peers, developing new skills and exhibiting social behavior. After a couple of successful days like this, individual introductions were slowly made. Komet was the first to be introduced to Chico. Komet and Chico gave each other a cursory glance, as if they were old friends. Then they went about their business. The same happened with Ori and Bonnie. Chico was accepted quickly by all like a younger brother. 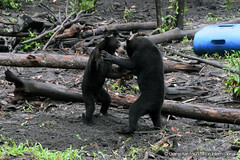 All of the older bear peers, particularly Bonnie, initiated play with Chico. Probably a little overwhelmed, Chico would try to outrun Bonnie, but Bonnie would always chase him down and pile on top of him. Chico wouldn’t take this lying down, and would respond by jumping onto Bonnie, tugging at his coat as they rolled about, happily play-fighting. Chico’s next step was to spend some time in the open enclosure by himself. After familiarizing himself with all the nooks and crannies of the forest enclosure, he proceeded to engage in a favorite pastime, digging! He dug away for hours, slowly moving along with his face buried in the mud, using his keen sense of smell to identify a smorgasbord of scents. He then began to climb some of the trees, seemingly overjoyed to be able to explore in such a big space. Once he had settled into a comfortable spot on the ground where he could lie down and relax, he couldn’t be lured back into the sleeping enclosure, not even for something to eat. Chico is content to enjoy his own company, as long as he has somewhere to dig or laze about. He knows what he wants! Chico eventually moved in full time to share the space with his peers. He enjoys his corner spot where he digs or rests in one of the burrows he has fashioned for himself. The other three bears have simply taken him on as one of their own. When Komet is enjoying a tasty termite nest for example, he will bark at Ori or Bonnie if they get too close, but he accommodates Chico’s advances with no fuss. Chico has settled in nicely to his new “digs” and has developed tastes and preferences. He wolfs down honey and can get quite worked up when it’s gone. 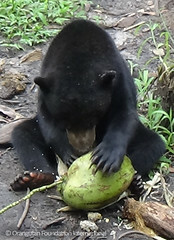 He uses his long claws to dig through papaya fruit, and loves to prise open coconuts. If there were a prize for fastest deshelling of coconuts, Chico would be a top contender. He rolls onto his back while he quickly scrapes away the outer shell of the coconut, and then digs his sharp claws into the inner layer, greedily drinking away at the refreshing juice inside, all of this in a few minutes time. Since his move into the new space, Chico’s demeanor has improved dramatically. While he still suckles himself occasionally, he seems much more content now with the added stimulus the space and his peers provide him. OFI will continue to monitor his progress, encourage natural behaviors, and ensure his quality care. 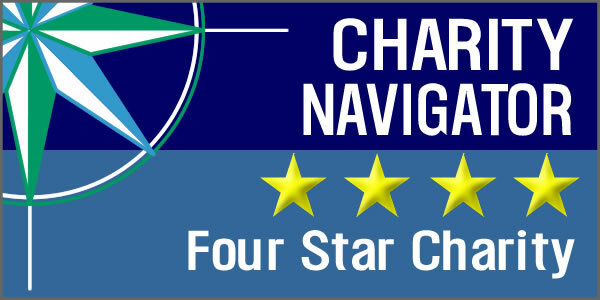 Chico’s rescue is a good luck story with many entities coming into play. 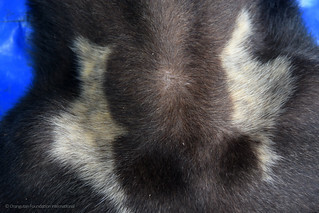 But, of course, his biggest debt, in addition to all who helped directly to rescue him and enabled him to move to the Care Center, would be to the wonderful OFI donors and contributors who make his continued care and support possible. Great, uplifting article! 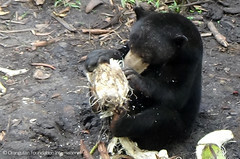 Chico is a very fortunate sun bear…and absolutely adorable. 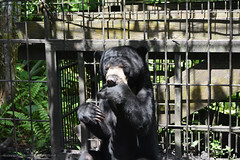 Many thanks to Ibu, Dr. Galdikas, and all those who helped rescue and care for him. 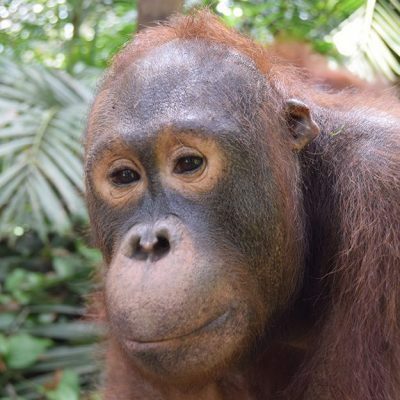 OFI is to be commended for all that they do for orangutans but also for using their resources to care for other types of animals in need, like Chico.